Eliciting a consequence is not imposing a punishment. Students learn that they have choices; it makes them more reflective, that they can handle or figure out problems, and that I respect their ideas (even though I don’t always agree with them). Respecting your students is the fastest way to get them to respect you. The Raise Responsibility System is so easy to implement. I’d like to share with you how your Discipline without Stress system has worked for me. I started my career in education as a substitute teacher. I thought that being tough and enforcing rules was the way to control a class. However, in my first year of full-time teaching I noticed I was only getting about 20 minutes of actual instruction time in a 55-minute instructional period. The rest of the time was spent telling students what to do, how to behave, lecturing, and even threatening with punishments. By the end of the day I was exhausted! This is a synopsis of the study. It does not contain references, graphs, or illustrations. The child’s problem was angry, aggressive, impulsive, and with non-compliant behaviour. He did not have the skills to control these impulsive reactions to transform himself into a child who could control his behavior and make choices that would enable him to have a successful transition into Kindergarten. He simply lacked socially acceptable skills. When I was offered a teaching position at Central Florida Aerospace Academy, it was shrouded with the understandable skepticism that surrounds most first year teachers. Could this “rookie” really handle a predominately male academy offering a notoriously male dominated curriculum? The answer was and is ABSOLUTELY YES! What my administrators did not know at the time was the finely tuned instrument I had tucked away in my “classroom bag of tools,” namely, Dr. Marvin Marshall’s Raise Responsibility System. This is the conclusion of our first year using your program. We all read the book last summer and had discussion sessions. We started off the year all on the same page. There was some concern that being so polite and respectful to our children would not work since they were not used to being dealt with respectfully. We are a school filled with students at risk, 99% African American and 96% receive free or reduced school lunch. We have been very impressed with the program. Every teacher has the chart on the wall and every teacher uses the same terms. About a week before school started I went online looking for a way to provide a suitable reward system to make sure that my classes were positive and motivated. I knew that rewards were more effective than punishments, or so I thought. I did a search for “Discipline Rewards” and your site popped up. I started reading your website and I was immediately on-board. After spending about an hour on your site, I decided to try your system this year. I spent the second day of school talking to my classes about the hierarchy. Their homework was for them to go online and research the Raise Responsibility System. We discussed their viewpoints and the changes started immediately. Last April, I started a new life journey that has dramatically changed who I am as a principal as well as who I am as a person. I was completing my fifth year as an elementary public school principal. One of my colleagues recommended I attend the National Association of Elementary School Principals (NAESP) Convention in Anaheim, California. He had attended the conferences in the past and found them highly worthwhile. Junior High School is a time for adolescents to make choices but also to rely on the guidance and counsel of adults who are important in their lives. At Selah Junior High School we use four levels of social development to help us discipline, or teach, our students how to succeed at school and in life. The first two levels are not acceptable at school. Anarchy is the absence of order and is characterized by chaos. Next is bullying or bossing and is characterized by bothering or bossing others and breaks our standards at school. Last year I was in the last months of my 13th year of teaching middle school math when I saw you at the California League of Middle Schools Conference in San Jose, CA. I was my county’s Teacher of the Year and yet I was contemplating finding a different occupation. The following is a letter sent from a teacher to another teacher who inquired about the approach that promotes self-discipline and learning without the use of rewards, threats, or punishments. The writer sent the letter to me and has given me permission to reproduce and share it. 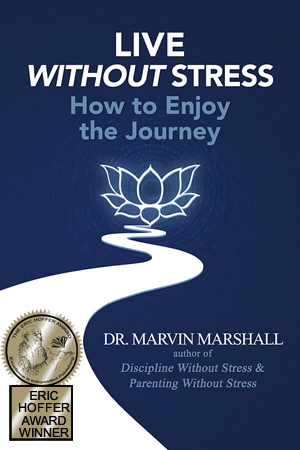 Just last year, I too, found Marvin Marshall’s book. My teaching partner and I had been looking for YEARS for a concrete approach to teaching and discipline based on INTERNAL motivation but never ever thought we could really find such a thing. But this is it! We love it! It’s a very powerful way to teach and work with people, regardless of their age—even with pre-schoolers.